Aim: The aim of this study was to assess the knowledge and attitude of general dental practitioners (GDPs) toward performing the proper standards of care while managing patients undergoing endodontic treatment in Saudi Arabia. Materials and Methods: An e-questionnaire was distributed among GDPs in Saudi Arabia (n = 650). The e-questionnaire questions covered the assessment of knowledge, attitude, and performance of GDPs toward practicing the proper standards of endodontic treatment in their clinic. Data were analyzed using SPSS version 22, and the relationships between categorical variables were established using Chi-square test. Results: Most of the participants reported obtaining full medical history before root canal treatment (RCT, 82.3%; P < 0.05). However, only 12.2% of the participants regularly measure the blood pressure for their patients before starting RCT. 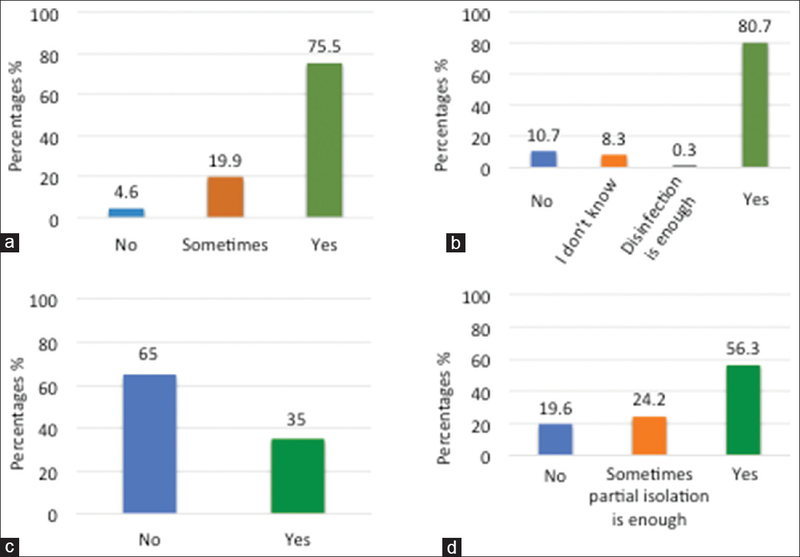 Only 56.3% of the participated dentists are applying rubber dam isolation during RCT, while 24.2% believe that partial isolation is sufficient for such a procedure (P < 0.05). Furthermore, 42.8% of the surveyed GDPs use cold test to confirm the endodontic diagnosis, while 55.5% think that percussion is a reliable method for diagnosis (P < 0.05). Surprisingly, 37.3% of the dentists still prefer leaving the tooth open for pain relief and drainage in abscess cases. Finally, only 28.7% of the participants mentioned performing regular follow-up after RCT. Conclusions: Our data show a clear deficiency in the standards of care provided by GDPs when performing RCT in Saudi Arabia. We hope that this publication will help highlight key areas where lack of knowledge and poor attitude exist while performing RCT by the GDPs in Saudi, thereby helping to raise treatment standards and improve treatment outcomes. The main goals of endodontic treatment are saving natural teeth and restoring the health of periapical tissues which have biological, functional, esthetic, and financial advantages. Endodontic treatment outcomes are affected by multiple prognostic factors that should always be discussed with patients. Some of those important factors include pulpal and periapical status, the level of canals debridement and obturation quality, procedure errors, the quality of coronal restoration, and the introduction of innovative instruments used by the dentists according to his/her skills and knowledge.,,, In addition, several studies suggested a negative influence between systemic diseases and root canal treatment (RCT) outcomes such as diabetes, hypertension, and coronary artery diseases., Moreover, dentists can play an important role in detecting life-threatening conditions (e.g., hypertension) by routinely measuring blood pressure (BP)., However, the importance of this seems to be underappreciated in the dental field. Large number of RCTs are provided by general dental practitioners (GDPs) worldwide; however, studies have shown that most GDPs disregard basic principles of endodontic therapy, and so, the success rate of endodontic treatment performed by GDPs is low and below expectations.,,,, This discrepancy in the success rate might reflect a difference in the technical quality of the endodontic treatment performed. Several studies have investigated the knowledge and attitudes of dentists toward RCT procedures. This includes studies performed in the United States,, the United Kingdom (UK), Germany, Iran, India, and Pakistan. However, few studies had been conducted in Saudi Arabia.,,, All of the studies cited here have reported that the majority of GDPs do not follow the guidelines for standard RCT. Therefore, here, we aimed to assess the knowledge and attitude of GDPs toward performing the proper standards of care while managing patients undergoing endodontic treatment in Saudi Arabia. An anonymous English-language e-questionnaire was formulated using Google Forms. The e-questionnaire was distributed among GDPs in Saudi Arabia (n = 650). This study targeted GDPs working in major cities all around Saudi Arabia such as Jeddah, Mecca, Al-Taif, Al-Madina, Riyadh, Al-Damman, Al-Qassim, and Tabuk. The e-questionnaire stem contained the title and the purpose of conducting the project. All participants confirmed that they answered the questions to the best of their knowledge and according to their daily dental management in practice. Furthermore, participants agreed to the use of the provided information for research and educational purposes. The final version of the e-questionnaire was reached after distributing 35 questionnaires to assess the clarity and validity of the questions, which resulted in a few modifications. The e-questionnaire was composed of 32 questions that assessed the knowledge, attitude, and performance of GDPs toward practicing the proper standards of endodontic treatment in their clinic. The e-questionnaire was sent randomly by text message to all 650 GDPs practicing in different cities in Saudi Arabia at the same time, and then a reminder was sent 3 weeks after to the ones that did not respond. The e-questionnaire included written consent, which was provided by all participants. The e-questionnaire was approved by the Research Ethics Committee Review Board from King Abdulaziz University, Faculty of Dentistry, Ref. number 014-01-17. This project was approved by the committee and was in full accordance with the World Medical Association Declaration of Helsinki. IBM SPSS Version 22, (Armonk, New York, USA). Simple descriptive statistics were used to define the characteristics of the study variables using numbers and percentages for categorical variables. To establish a relation between categorical variables, we used the Chi-square test, where a P < 0.05 was taken to indicate statistical significance. All of the significant variables are listed in the tabulated representations. The response rate was 50.03%. Among the total respondents, 64.8% were male and 35.2% were female. Most of our participants were newly graduates (54.1%) and working in private practice (54.0%). The demographic data of the respondents are given in [Table 1]. Most of the participants reported obtaining medical history before RCT (82.3%). However, only 12.2% of the GDPs always measure the BP for their patients before starting RCT, and 80.1% of the GDPs screen their patients for problems other than the chief complaint and tell them about these findings [Figure 1]. 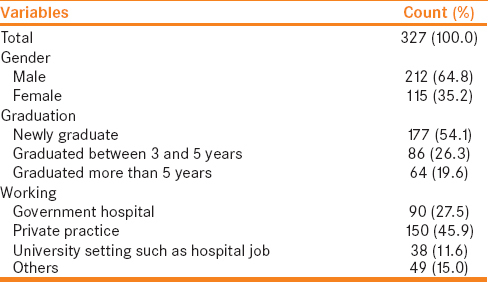 There were significant differences between males and females (P < 0.05) and between people who worked in a government hospital versus private practice and hospital jobs (P < 0.05) in regard to screening for problems other than the chief complaint. In addition, comparing genders, there was a significant difference in medical history taking (P < 0.05) [Table 2]. Among the participated dentists, 75.5% wash their hands before and after treating each patient, and the majority of the respondents, i.e. 80.7%, change the hand-piece between patients as part of their dental practice policy [Figure 2]a and [Figure 2]b. The latter was significant (P < 0.05) among practitioners working in different sectors [Table 2]. About 65% of the participating dentists believe that disinfecting the hand-piece after each patient is not sufficient after performing endodontic treatment [Figure 2]c. This was significant (P < 0.05) between males and females [Table 2]. Regarding rubber dam application, 56.3% of the participating dentists are applying rubber dam isolation when performing RCT, while 24.2% believe that partial isolation is sufficient for this procedure [Figure 2]d. Unfortunately, 19.6% of the dentists perform RCT without rubber dam isolation [Figure 2]d. This was statistically significant in terms of gender (P < 0.05), duration since graduation (P < 0.05), and working area (P < 0.05) [Table 2]. Regarding diagnosis of teeth that need RCT, 42.8% of the participating dentists use a cold test to confirm their decision, 55.5% think that percussion is a reliable method for diagnosis, and 21.4% use a perio-probe to check the presence of any pocket depth around the affected tooth before starting the RCT procedure [Figure 3]a, [Figure 3]b, [Figure 3]c. Regarding the use of the cold test to confirm the endodontic diagnosis, we detected significant differences in terms of genders (P < 0.05), the time since graduation (P < 0.05), and working sector (P < 0.05) [Table 2]. Approximately 86.9% and 89.9% of the GDPs take preoperative radiographs and postoperative periapical radiographs before and after RCT, respectively [Figure 3]d and [Figure 3]e. The majority (70.3%) of the GDPs might take one or more radiographs depending on the case, while 19.3% rely on only one straight-angled radiograph [Figure 3]f. There was a significant difference in taking posttreatment periapical radiograph and the time elapsed since graduation (P < 0.05) and working sector (P < 0.05) [Table 2]. Sodium hypochlorite (NaOCl) irrigation solution is used by 44.6% (full concentration) and 50.8% (diluted) of the participants. 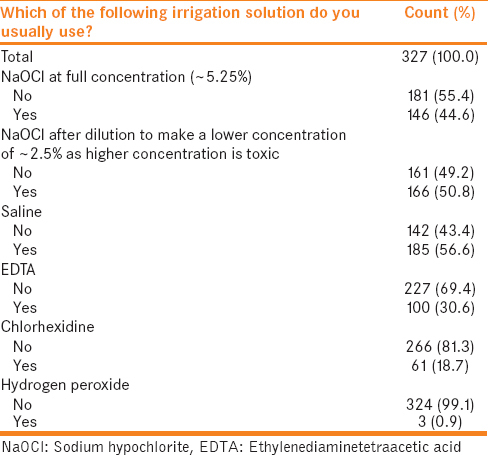 In addition, 56.6% mentioned using saline as irrigation solution compared to 30.6% who mentioned using ethylenediaminetetraacetic acid [Table 3]. 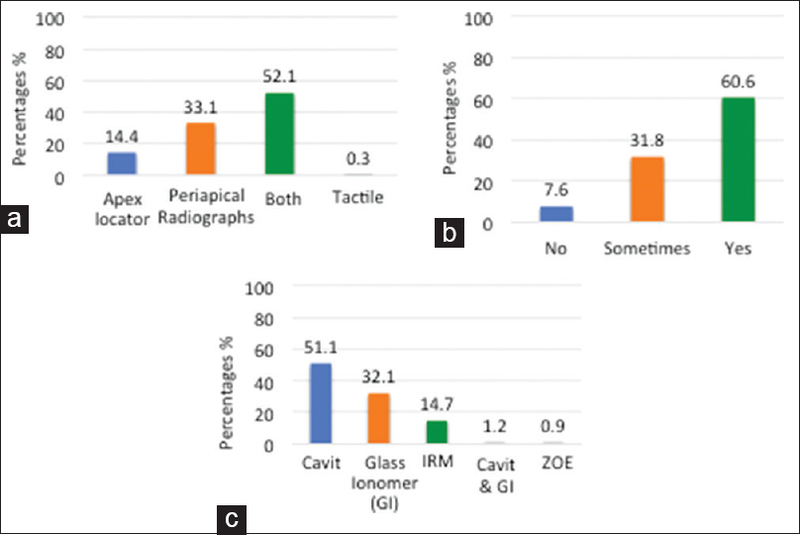 Regarding working length (WL) determination, 33.1% of the respondents are using conventional radiographs, whereas 14.4% reported using electronic apex locators (EALs) and 52.1% are using a combination of both radiography and EAL [Figure 4]a. Most practitioners (60.6%) use intracanal medication (ICM) between RCT visits [Figure 4]b. Cavit is the most preferred temporary filling material (51.1%), followed by glass ionomer (32.1%) and IRM (14.7%) [Figure 4]c.
About 73.3% of the GDPs reported that they perform RCT procedures on molars. However, 55.4% perform only simple retreatment cases and refer the difficult ones [Figure 5]a and [Figure 5]b. About 52.6% of the GDPs complete RCTs in two visits, while 30.9% do it in more than two visits. Only 16.5% reported completing RCT in single visits [Figure 5]c.
About 77.7% of the practitioners instruct their patients to take painkillers after RCT only if they feel pain [Figure 5]d. Ibuprofen (400 mg) is the most commonly prescribed painkiller (49.8%), followed by ibuprofen (600 mg, 26%) and then acetaminophen (16.2%) [Figure 5]e. In addition, 19.3% of the dentists believe that prescribing an antibiotic after RCT will decrease postoperative pain [Figure 5]f.
About 48.3% of the GDPs never prescribed antibiotics in cases of severe pain and confirmed the diagnosis of irreversible pulpitis, while 51.7% might prescribe antibiotics at different occasions, such as a couple of days before or after starting RCT [Figure 6]a. In case of patients who were diagnosed with pulp necrosis (nonvital tooth) and had localized fluctuating swelling, 34.9% of the participating dentists mentioned prescribing antibiotics for a couple of days then starting RCT, whereas 34.6% mentioned starting RCT, performing incision and drainage, and then prescribing antibiotics [Figure 6]b. However, 19.6% of the participating dentists will start RCT and perform incision and drainage without the need for prescribing antibiotics [Figure 6]b. In abscess cases, 47.1% of the dentists would never leave the tooth open for pain relief and drainage, while 37.3% sometimes do so [Figure 6]c. In case of badly decayed but still restorable teeth, the majority of GDPs will suggest the treatment plan of undergoing RCT and then crowing the tooth (85.6%), while only 10.1% suggest extraction and undergoing implant replacement [Figure 6]d.
In the present study, only 28.7% of the participants mentioned performing regular follow-up for their cases after RCT, whereas 55.0% would do so occasionally [Figure 6]e. About 35.3% believe that the follow-up of 6 months is sufficient compared to 25.2% and 12.6% who suggest a 1-year follow-up or more, respectively [Figure 6]f.
This study was conducted to assess the knowledge and attitude of GDPs toward performing the proper standards of care while managing patients undergoing endodontic treatment in Saudi Arabia. This study targeted GDPs because epidemiological studies have shown that the failure rate of RCTs is higher among teeth treated by nonspecialized dentists compared to endodontists. We believe that GDPs should always follow endodontic standard guidelines recommended by well-known endodontic societies such as the American Association of Endodontists (AAE). The Saudi Council of Endodontics is following the AAE guidelines, especially for diagnosis and other important clinical aspects in endodontics. In addition, te AAE guidelines for diagnosis is the official dental terms of the educational centers in Saudi Arabia. Our survey questions evaluated key steps that must be taken in the process of performing RCT. Violation of the proper standards in these steps by GDPs can affect the treatment outcome. Although the majority of our participants mentioned taking the full medical history of patients before RCT, 17.7% do not, which can be considered a clear violation of the proper standard of care. Accurate and complete recording of a patient's medical history can help the dentists to achieve an accurate diagnosis, assist treatment modification and planning, prevent unexpected complications during and after treatment, and also ensure better prognosis and treatment outcome.,, Moreover, only 12.2% measure the BP routinely of all patients. This result is in agreement with Greenwood and Lowry, who reported that 4.8% of GDPs measure routinely the BP, and this percentage reached to 9.2% when patients mentioned a BP issue. Hypertension is one of the leading causes of death worldwide and is a major risk factor for heart disease and stroke. Thus, increasing GDPs awareness about hypertension and emphasizing their role in screening patients for such disease will surely help in early detection and diagnosis and aid in better management and treatment of these patients. Pulpal diagnosis can be a challenging task for GDPs. It is well known that the applied tests have greater specificity than sensitivity. Thus, several tests are always required to reach a proper definite endodontic diagnosis.,, Dental pulp tests, such as cold test and the electronic pulp test (EPT), have been commonly used and are helpful aids to endodontic diagnosis. In addition, it was found that using cold pulp test in combination with an EPT, for the evaluation of pulp vitality, provided more accurate results than using one of them alone. Here, 42.8% of the GDPs use the cold test to confirm their diagnosis of teeth that needed RCT, while 55.5% thought that percussion is a reliable method for endodontic diagnosis, and only 21.4% use a perio-probe to check for the presence of pocket depth around the affected tooth before starting the procedure. This, unfortunately, shows a lack of knowledge of our GDPs in regard to endodontic diagnosis protocols. Positive percussion test results can only indicate an inflammation at the periapical area, but it is not always necessary to be of endodontic origin. Thus, percussion tests tend to have low specificity and sensitivity values compared to the cold test, especially when it comes to the diagnosis of cases with irreversible pulpitis. The pain of periodontal origin can sometimes mimic pulpal pain symptoms. Thus, to prevent misdiagnosis, perio-probing should not be neglected. Taking good preoperative radiographs at multiple angles can play a significant role in the diagnosis and treatment planning process. Such radiographs would provide dentists with useful information, such as the presence, extent, and severity of periapical pathology. Furthermore, taking postoperative radiographs is important from a medico-legal point of view and provides baseline information for follow-up and assessment of treatment outcome. Indeed, the majority (86.9%) of the participants take preoperative radiographs before RCT procedures. This percentage is in agreement with a study conducted in Karachi, but in contrast to a similar study conducted in the city of Riyadh, Saudi Arabia, where they reported a much lower percentage (27%). This may be explained, at least in part, that our study included GDPs from major cities around Saudi Arabia compared to all other published studies that conducted their study only in one city or single region of Saudi. On the other hand, our results also revealed that a high percentage of our GDPs (89.9%) do take postoperative radiographs after treatment, which is similarly reported by a study conducted among UK dentists (75%). To date, there is no single temporary or interim ideal restoration to be used with teeth undergoing RCT. Thus, GDPs should use their judgment to select the suitable temporary restoration that can be easily distinguished from natural tooth structure for easy removal between appointment, and also has considerable tensile strength to achieve good coronal seal., In the current study, cavit was the preferred temporary filling used to seal the coronal access after RCT (51.1%), followed by glass ionomer (32.1%) and IRM (14.7%). Similar results were reported by others where cavit was still the preferred temporary filling used by GDPs (77.7%). In regard to GDP's endodontic case selection and management, we found that 73.3% of the GDPs do perform RCT on molars and that 55.4% perform simple retreatment cases and refer others. In addition, only 16.5% of the GDPs complete RCTs in one visit, compared to 52.6% and 30.9% that would finish the RCTs in two or more visits, respectively. This is in agreement with other studies where GDPs also need two or more visits to complete RCTs., To prevent any undesired treatment outcomes and complications, GDPs should be aware of their limits and capabilities and consider referral depending on endodontic case difficulty assessment. Burry et al. reported that, after 10 years, molars treated by endodontists have significantly higher survival rates than molars treated by nonendodontists. This finding demonstrates the importance of GDPs understanding their limitations when attempting to perform RCTs. Adjunctive antibiotic prescription guidelines have been recommended by the AAE-Endodontics. The prescription of antibiotics includes cases such as the presence of trismus, increased swelling, and cellulitis. However, the presence of pain or cases of irreversible pulpitis or necrotic teeth do not require the prescription of antibiotics., In our study, 48.3% of the participants believe that prescribing antibiotics after RCT would do nothing to decrease postoperative pain; however, in case of necrotic teeth with swelling, 34.9% prefer prescribing antibiotics for a couple of days before starting treatment. To prevent the increase of drug-resistant microbes, GDPs should be careful when it comes to prescribing antibiotics and should adhere to the recommended guidelines. Our data also show that 52.9% of the participants still consider leaving the tooth open in cases of tooth abscess. This misconcept must be taken seriously as it undermines the whole concept of canal debridement and elimination of the source of infection to decrease the cause of the pain and swelling. Finally, it is important to understand that RCT does not end with the obturation step. Achieving final coverage and following up of the case to ensure that healing has taken place should be an integral part of RCT. Here, we found that only 28.7% of the participants follow up their cases and 35.3% of them believe that 6 months is a good follow-up period. The favorable outcome of endodontic treatment depends on the absence of signs and symptoms and the decrease/resolution of periapical lesions. Therefore, the delayed disappearance of the apical lesion should not be considered as a failure as long as the involved teeth are functional and in the healing phase. In addition, radiographic follow-up of periapical status after endodontic treatment can be noticeable from 3 months to 2 years depending on the size of the periapical lesion, where 1 year seems to be a good follow-up point for treatment evaluation. To improve the quality of treatment and to ensure that Saudi patients achieve promising and predictable treatment outcomes, there is an urgent need to increase the knowledge and awareness of the GDPs toward following endodontic standard guidelines recommended by well-known endodontic societies (e.g. AAE). Following these standards should always be emphasized when developing dental curriculum and highlighted in continuing dental education courses. We hope that publishing this study will highlight where lack of knowledge and poor attitude exist while performing RCT by GDPs in Saudi and thus help in raising treatment standards. We acknowledge and thank Kalvin Balucanag and his team for helping with the data tabulation and analysis. We also thank Dr. Majdi Munshi and Dr. Omer F. Alqurashi for their help in distributing the e-questionnaire. Sjögren U, Figdor D, Persson S, Sundqvist G. Influence of infection at the time of root filling on the outcome of endodontic treatment of teeth with apical periodontitis. Int Endod J 1997;30:297-306. Segura-Egea JJ, Castellanos-Cosano L, Machuca G, López-López J, Martín-González J, Velasco-Ortega E, et al. Diabetes mellitus, periapical inflammation and endodontic treatment outcome. Med Oral Patol Oral Cir Bucal 2012;17:e356-61. Wang CH, Chueh LH, Chen SC, Feng YC, Hsiao CK, Chiang CP, et al. Impact of diabetes mellitus, hypertension, and coronary artery disease on tooth extraction after nonsurgical endodontic treatment. J Endod 2011;37:1-5. Ojehanon PI, Akhionbare O. Hypertension among dental patients attending tertiary health institution in Edo state, Nigeria. Niger J Clin Pract 2007;10:220-3. Fernández-Feijoo J, Núñez-Orjales JL, Limeres-Posse J, Pérez-Serrano E, Tomás-Carmona I. 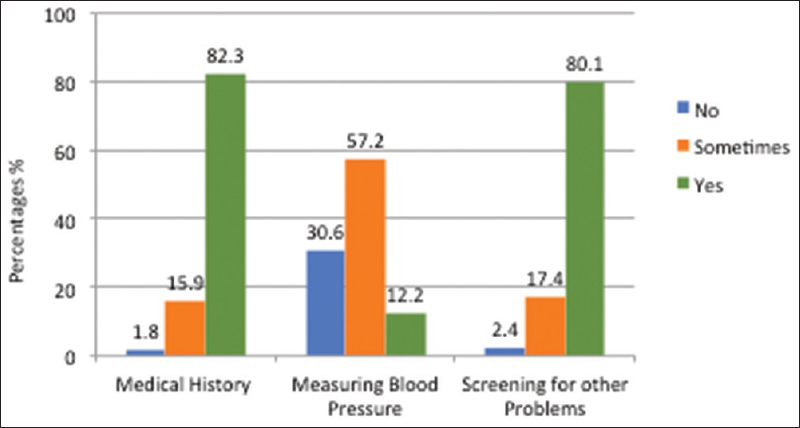 Screening for hypertension in a primary care dental clinic. Med Oral Patol Oral Cir Bucal 2010;15:e467-72. Bernstein SD, Horowitz AJ, Man M, Wu H, Foran D, Vena DA, et al. Outcomes of endodontic therapy in general practice: A study by the practitioners engaged in applied research and learning network. J Am Dent Assoc 2012;143:478-87. Alley BS, Kitchens GG, Alley LW, Eleazer PD. A comparison of survival of teeth following endodontic treatment performed by general dentists or by specialists. Oral Surg Oral Med Oral Pathol Oral Radiol Endod 2004;98:115-8. Iqbal A. The factors responsible for endodontic treatment failure in the permanent dentitions of the patients reported to the college of dentistry, the university of Aljouf, Kingdom of Saudi Arabia. J Clin Diagn Res 2016;10:ZC146-8. Burry JC, Stover S, Eichmiller F, Bhagavatula P. Outcomes of primary endodontic therapy provided by endodontic specialists compared with other providers. J Endod 2016;42:702-5. Weiger R, Axmann-Krcmar D, Löst C. Prognosis of conventional root canal treatment reconsidered. Endod Dent Traumatol 1998;14:1-9. Raoof M, Zeini N, Haghani J, Sadr S, Mohammadalizadeh S. Preferred materials and methods employed for endodontic treatment by Iranian general practitioners. Iran Endod J 2015;10:112-6. Gaikwad A, Jain D, Rane P, Bhondwe S, Taur S, Doshi S, et al. Attitude of general dental practitioners toward root canal treatment procedures in India. J Contemp Dent Pract 2013;14:528-31. Siddiqui T, Wali A, Anwar A. Attitudes, techniques and trends in endodontic treatment by the house surgeons in dental institutes – Karachi. Int J Contemp Dent Med Rev 2015; 2015:1-6. Natto ZS. A survey of root canal treatment in Saudi Arabia: A pilot study. Oral Health Dent Manag 2014;13:354-8. Mathew S, Al Nafea M. An evaluation of the current endodontic trends among the general dental practitioners and specialist in Riyadh, Ksa. Int J Innov Educ Res 2015;3:8-19. Mortazavi H, Rahmani A, Rahmani S. Importance, advantages, and objectives of taking and recording patient's medical history in dentistry. Int J Med Rev 2015;2:287-90. Ramasamy C. Protocols for hypertensive patient management in the dental office. Int J Med Dent 2013;3:267-9. Greenwood M, Lowry RJ. Blood pressure measuring equipment in the dental surgery: Use or ornament? Br Dent J 2002;193:273-5. Benjamin EJ, Blaha MJ, Chiuve SE, Cushman M, Das SR, Deo R, et al. Heart disease and stroke statistics-2017 update: A report from the American Heart Association. Circulation 2017;135:e146-603. Yamalik N, Van Dijk W. Analysis of the attitudes and needs/demands of dental practitioners in the field of patient safety and risk management. Int Dent J 2013;63:291-7. Available from: http://www.mv-endo.com/pdfs/AAE-Fact-Sheet-Patient-Safety.pdf. [Last accessed on 2018 Feb 20]. Available from: https://www.aae.org. [Last accessed on 2018 Feb 10]. Unal GC, Kaya BU, Tac AG, Kececi AD. Survey of attitudes, materials and methods preferred in root canal therapy by general dental practice in Turkey: Part 1. Eur J Dent 2012;6:376-84. Kaboré WA, Chevalier V, Gnagne-Koffi Y, Ouédraogo CD, Ndiaye D, Faye B, et al. Asurvey of endodontic practices among dentists in Burkina Faso. J Contemp Dent Pract 2017;18:641-6. Lin LM, Skribner JE, Gaengler P. Factors associated with endodontic treatment failures. J Endod 1992;18:625-7. Engström B, Lundberg M. The correlation between positive culture and the prognosis of root canal therapy after pulpectomy. Odontol Revy 1965;16:193-203. Madarati AA. Why dentists don't use rubber dam during endodontics and how to promote its usage? BMC Oral Health 2016;16:24. Hyman JJ, Cohen ME. The predictive value of endodontic diagnostic tests. Oral Surg Oral Med Oral Pathol 1984;58:343-6. Chen E, Abbott PV. Dental pulp testing: A review. Int J Dent 2009;2009:365785. Weisleder R, Yamauchi S, Caplan DJ, Trope M, Teixeira FB. The validity of pulp testing: A clinical study. J Am Dent Assoc 2009;140:1013-7. Yusof Z, Nambiar P. Radiographic considerations in endodontics. Malays Dent J 2007;28:51-8. James LG. Apical termination of root canal procedures-ambiguity or disambiguation? Evid Based Endod 2016;1:4. Mohan G, Anand V. Accuracy of different methods of working length determination in endodontics. J Dent Med Sci 2013;12:4. Mello I. Use of electronic apex locators may improve determination of working length. Evid Based Dent 2014;15:120. Vieyra JP, Acosta J, Mondaca JM. Comparison of working length determination with radiographs and two electronic apex locators. Int Endod J 2010;43:16-20. Mensudar R, Sukumaran VG, Julius A. Evaluation of current trends in endodontic treatment procedure among the dental practitioners. Int J Dent Health Sci 2014;1:861-8. Gorduysus M, Tuncel B, Nagas E, Gorduysus O, Ergunay K, Yurdakul P,et al. Antimicrobial effects of various endodontic irrigants on selected microorganisms. J Hacettepe Fac Dent 2011;35:41-6. Stojicic S, Zivkovic S, Qian W, Zhang H, Haapasalo M. Tissue dissolution by sodium hypochlorite: Effect of concentration, temperature, agitation, and surfactant. J Endod 2010;36:1558-62. Ayhan H, Sultan N, Cirak M, Ruhi MZ, Bodur H. Antimicrobial effects of various endodontic irrigants on selected microorganisms. Int Endod J 1999;32:99-102. Clegg MS, Vertucci FJ, Walker C, Belanger M, Britto LR. The effect of exposure to irrigant solutions on apical dentin biofilms in vitro. J Endod 2006;32:434-7. Peciuliene V, Rimkuviene J, Aleksejuniene J, Haapasalo M, Drukteinis S, Maneliene R, et al. Technical aspects of endodontic treatment procedures among lithuanian general dental practitioners. Stomatologija 2010;12:42-50. Udayakumar P, Mamta K, Neha P, Shikha A. Coronal leakage of provisional restorative materials used in endodontics with and without intracanal medication after exposure to human saliva. Saudi Endod J 2016;6:77-81. Madarati AA, Zafar MS, Sammani AMN, Mandorah AO, Bani-Younes HA. Preference and usage of intracanal medications during endodontic treatment. Saudi Med J 2017;38:755-63. Jensen AL, Abbott PV, Castro Salgado J. Interim and temporary restoration of teeth during endodontic treatment. Aust Dent J 2007;52:S83-99. Keiser K, Hargreaves K. Building effective strategies for the management of endodontic pain. Endod Topics 2002;3:93-105. Bedwell J, Pierce M, Levy M, Shah R. Ibuprofen with acetaminophen for postoperative pain control following tonsillectomy does not increase emergency department utilization. Otolaryngol Head Neck Surg 2014;151:963-6. Aminoshariae A, Kulild JC. Evidence-based recommendations for antibiotic usage to treat endodontic infections and pain: A systematic review of randomized controlled trials. J Am Dent Assoc 2016;147:186-91. Available from: http://www.aae.org/treatmentoptions. [Last accessed on 2018 Feb 10]. Elemam RF, Pretty I. Comparison of the success rate of endodontic treatment and implant treatment. ISRN Dent 2011;2011:640509. Huumonen S, Ørstavik D. Radiographic follow-up of periapical status after endodontic treatment of teeth with and without apical periodontitis. Clin Oral Investig 2013;17:2099-104.